One of the things I love the most in home decor are candles and home fragrances. When I get home during the week, I love coming in the door and being greeted by a pleasant scent. It relaxes me and automatically puts me in a better mood. What if there were home fragrances that were actually made to relax you? Febreze is one step ahead of the game. They recently released their Sleep Serenity Collection, which comes in three scents that are made to help you relax. 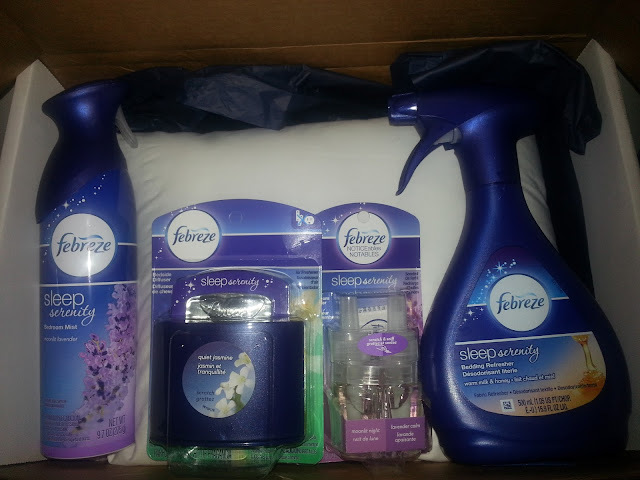 Febreze reached out to me a few months ago to try and review their new Sleep Serenity Collection. Because I love home fragrance and I am all about my beauty rest, I jumped at the opportunity. Before we dive into the review, let's read more about the collection. Give your sleep schedule a tranquil touch, and rediscover peaceful sleep with the help of the Febreze® Sleep Serenity™ Collection. Try all three soothing scents, each specially blended to help you relax. Use Febreze Sleep Serenity nightly to help calm your senses and leave the day’s stresses behind, so you can wake up rested, refreshed, and ready to greet the day. The only question that comes to my mind as I was doing this review is, "How can you not like Febreze?" Before I even knew of the Sleep Serenity Collection, I was a fan of Febreze. It's quite frankly the bomb. The original scent is amazing and I have seen it get rid of some of the smelliest odors. With that said, I was literally gushing at trying this new collection. With this collection, the first thing I will discuss are the actual scents. Febreze kindly sent me all three scents (Quiet Jasmine, Moonlit Lavender, Warm Milk and Honey) to try. I will say that all three scents were amazing; however, I found that Quiet Jasmine was the strongest scent out of the three. As someone who has allergies that flare from time to time, I found that this scent was a little too strong for me. However, the actual scent smelled great. My personal favorite was the Warm Milk and Honey. It has a light, warm smell that just puts me automatically in a relaxing mood. Moonlit Lavender was also another favorite. Lavender has always been a scent that puts me at ease. As for the four forms for each scent, I will say that I can see all four forms being beneficial, but it depends on your preference. I particularly loved the Bedding Refresher. Marvelous! You simply spray it on your bedding, allow to dry and it smells amazing. The Bedroom Diffuser, Mist and Bedside Diffuser all seem to have the same purpose, which is giving a scent to your entire bedroom. I liked them all, but I will say, I got more use from the Bedside Diffuser and Bedroom Diffuser. They gave a great scent to my overall bedroom. Plus, they are stationary so you set them up and leave it until it's time to be changed. I found that each lasted around 30 days. The Bedside Diffuser is also small and compact so you can place it in a discrete area or have it out as decoration. The Bedroom Diffuser plugs into the wall. I also found the Bedroom Mist to be nice; however, I mainly used it to freshen the area throughout my apartment if I had guests. YES! Without a doubt, I would recommend this collection. I will say that you may not need all four items because a few have the same use. If I were to recommend any of the products specifically, it would be the Warm Milk and Honey fragrance in the Bedding Refresher, Bedroom Diffuser and Bedside Diffuser. Have you spotted the Sleep Serenity Collection in stores? Have you tried it? Happy New Year.... I LOVE me some smell goods and Febreeze is by FAR one of my favorites! Thanks for sharing!!!! LOL! You are so funny. I can hear you saying smell goods right now. :-) If you try it, be sure to let me know how you like it! I've tried the Moonlit Lavender spray, and it's fantastic! I love spraying it right before bed. Love febreeze, tried the lavender kind but I will have to check out the bedroom diffuser. I guess I'm behind the times because I haven't seen the Sleep Serenity Collection. But I think I need to find some quick because I love lavender and Febreeze. It is my friend with three stinky kids and a pet. I haven't spotted this in the stores, but I'll definitely be on the look out for them! I love Febreze products. The Warm Milk & Honey Bedside Diffuser sounds like a must have for me. Thanks for the great review!